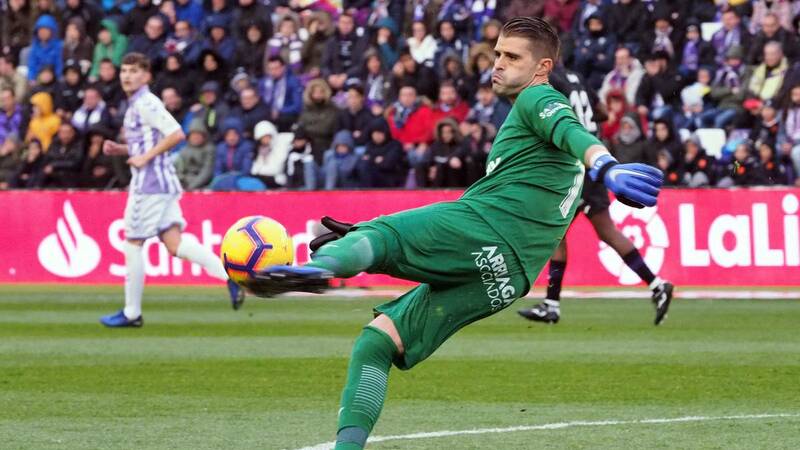 Home Soccer Cuéllar: "Al Leganés I give him an approval in the first round"
Cuéllar: "Al Leganés I give him an approval in the first round"
The Leganés goalkeeper warns that there is still "room for improvement". Named for the best player in December, he is the first to repeat the award. Iván, the 'Pichu', Cuellar is setting a sensational season with the Leganés. Perhaps one of the best of his career. For Mauricio Pellegrino is untouchable. Yes or yes, he always plays. Neither the presence (and pressure) to have Andreiy Lunin, loaned by Real Madrid, deviates from the goal. The club has recently announced that it has been elected by the chess player of the month of December. is the first player of the blue and white team that repeats award. It was already appointed in September. Recognition that emphasizes its outstanding note, that has helped the Leganés to finish the first round with an "approved" . It is the rating that Cuéllar gives to the team. "I give the team a pass because we are within the numbers that mark the historical average to achieve the goal, which is to continue in the highest category," said the goalkeeper to receive this award from Mahou, one of the sponsors del Leganés. "Everything is in order of improvement", has continued to evaluate the first stretch of the blue and white season. " We will try to improve so that we can achieve these objectives well before the end of the season and stay as high as possible. Maybe this second round they will take off (or not) teams depending on the objectives. It is normal to see differences from now on. Hopefully we can be half board up, "has wished the Extremadura.
" We have capacity for improvement "
Cuéllar no gives special importance to the Camp Nou match against Barça with which they open this Sunday (20:45) the Second round. "We face it as one more," he said without forgetting that, for the remainder of the season "we have capacity for improvement." Outside the home is where the Lega must grow the most. At home (16 points out of the 22 added so far) the performance is still optimal. "That shows that fans have a lot to do in their help to the team" , he recalled a Cuellar that gives a lot of importance of their personal situation to the collective performance. "When we talk about a team sport everything works always and when the equipment works. I owe it to the team. If the team is well, one benefits from it, "he concluded.